Special Offer: Mention KidsLinked and receive a 10% discount off your school registration fee! Class space is limited, so register now and save! 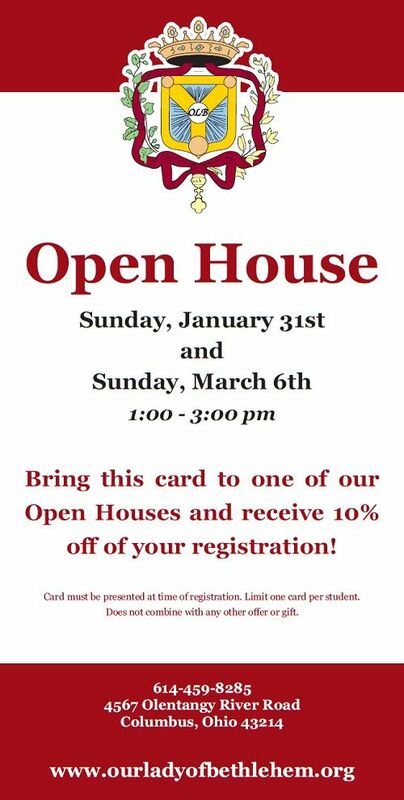 Attend the Our Lady of Bethlehem School and Childcare (OLB) Open House on Sunday, March 6th from 1:00pm to 3:00pm. Find out about the school, childcare and summer program. Selecting the best early education and childcare is a major decision as a parent. You want your child in a safe and loving environment that provides high-quality educational, social and spiritual development. Our Lady of Bethlehem provides all of that and more by being the ideal solution in giving your child an outstanding start from ages 6 weeks through Kindergarten. Small classes and student ration, caring faculty that ensures all children receive individual attention to develop spiritually, academically and socially. High academic quality with Kindergarten students scoring at or above the 85th percentile on standardized tests. Flexible childcare, latchkey and summer programs that are integrated with school curriculum for seamless growth one year to the next. The Catholic environment provides the tools for children to grow spiritually and gain a sense of self-worth as children of God, no matter their cultural or religious background. Hours of Operation: Childcare: Monday-Friday 7am-6pm; School: Monday-Friday 8:45am-3pm. Pricing: Check out Our Lady of Bethlehem’s Tuition page for more information! Find out what parents say about Our Lady of Bethlehem! For more information contact 614-459-8285 or lebling@cdeducation.org.